The different Departments at UODA are consistently reviewing ways to improve research and development. One of the recent initiatives taken was to establish contact with Jadavpur University to highlight innovative research in the field of medicine. 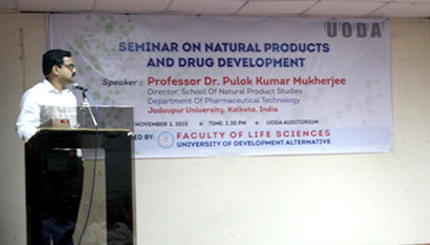 Professor Pollok Mukherjee from Jadavpur University, Kolkata, India delivered a seminar at UODA (Novembr 3, 2015) in which he highlighted the importance of research on medicinal plants. His seminar also included the topic of discovering new drugs from plants to combat emerging diseases, as well as old diseases, which have developed vector resistance to existing drugs. The team at UODA has arranged this to be a part of their learning for its students in medicine. The photograph shows Professor Pollok Mukherjee delivering his seminar at UODA.